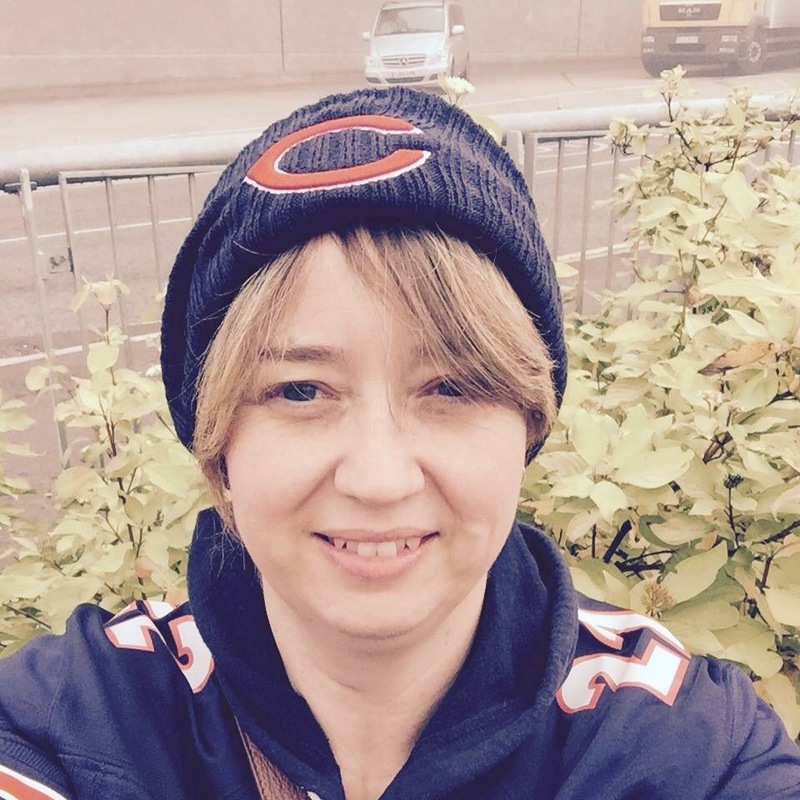 As part of our series in celebrating female NFL fans across the UK, I’d like to introduce you to Lindsey Jepson, a Chicago Bears fan. 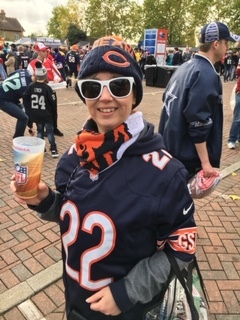 Lindsey shares with us how she got in to the NFL, how she made the choice of her team as well as more about her overall experience as a fan. As a huge sports fan, those who know me may be surprised to hear that I came relatively late to NFL, especially as I follow American sports and am a huge Baseball fan. Don’t get me wrong, I was always aware of the game and the ultimate accolade of the Superbowl. I’d even watched highlights on Channel 4 but something about the game didn’t quite click. 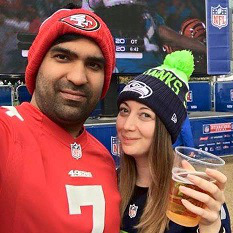 My initial introduction to NFL was as a fresh faced 20 year old student, living in student accommodation in Germany with a bunch of Americans. Sundays were always Football Sundays and our Thanksgiving celebration was dominated by talk about the game. I was baffled yet intrigued by phrases and terminology such as ‘direct snap’, ‘blitzing the quarterback’ and ‘run pass option’ let alone wondering why on earth you needed 4 downs to get 10 yards. Of course all this makes perfect sense now but it all seemed like a foreign language and to a languages student this was the incentive I needed. I visited friends in Cleveland and Nebraska and never fully understood why NFL wasn’t as popular as college football but getting the change to visit Memorial Stadium made me realise the enormity of the game. If this was happening at a college level then how huge would it be on a professional scale. 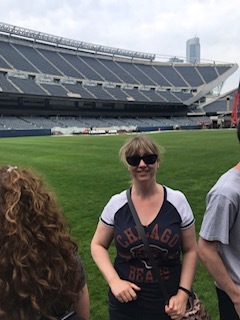 It wasn’t until I visited Chicago and saw Solder Field that I realised Bears were my team. I was already a huge Cubs fan but seeing the stadium I felt some sort of affinity and a connection as I peered from the walkway inside. It was from this moment onwards that I knew I had to learn more about the game. The atmosphere is very different to football in England (I refuse to call it soccer) and there is a very inclusive feel to it and the mix is not predominately male as I fully expected. I found the whole experience of the fan park with the different colours and the tailgating fascinating. Everyone chatted and discussed the game and to feel as if I was a part of it, rather than just tagging along was amazing. I don’t think you’d find another sport where the Commissioner is just wandering round mixing with and hi fiving fans. Of course there is the ultimate Fan girl moment when I spotted Shaun Gayle out the corner of my eye. Next thing I know I’m very excited and shout at my other half (and a bit too loudly) ‘There’s Shaun Gayle! !’ He obviously hears me, turns round and giggles at this woman dressed head to toe in Bears merch standing with her mouth open and pointing in awe. I didn’t have the courage to go over and ask for a photo but it made my day. Fastforward to 2018 and I’m back in Chicago and inside Solder Field. Unfortunately it’s the off season but I’m on a tour and it’s the closest I’ve been to seeing the Bears. Standing pitchside and touching the turf (we weren’t allowed on the field but touching the grass doesn’t count right?!?!) and I’m more determined than ever that I need to see the Bears play. Of course I’ve now convinced myself that my presence at Soldier Field was the lucky charm they needed for this season, never mind the brilliance of Coach Nagy, the acquisition of Khalil Mack or Trubisky’s great season, it’s all my doing. Now I have to hope that 2019 brings the Bears to London or else it’s a trip to Chicago and hope I’m the lucky charm I think they are and they can win a Superbowl!! Go bears! !